"Text Neck" It's a pain in the NECK! 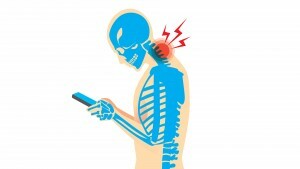 Text-Neck is a modern syndrome that describes neck and shoulder pain due to injury and damage caused by looking down at your smartphone, iPad or laptop. Pain in the neck has always been one of the biggest musculoskeletal pain problems in Australia. But over the past decade with the dramatic increase in the use of technology, neck pain is now effecting us in epidemic proportions. I now regularly have patients attend my clinic with severe neck and shoulder pain caused by sustained postures which are overloading the neck. The majority of them are spending hours per day emailing, Instagraming, Facebooking and whatever else is happening in the online world. What are the consequences of Text-Neck? There are many things that worry me about Text-Neck. But there are a few consequences that are the most troublesome for patients with the problem. When tissues are chronically overloaded, they break down. We all know that as we get older we get osteoarthritis (wear and tear) of the bones and cartilage. But with Text-Neck this is going to be accelerated dramatically! Degenerative osteoarthritis is not reversible. Meaning once you have it, it only gets worse and it never goes away. Your long term happiness and health is on the line here. The consequences of the choices you make today are serious and could completely alter the trajectory of your life. The intervertebral discs in your neck bear the brunt of the load on your neck in sustained forward head postures (like when you are checking your phone). This causes them to break down and leads to very serious pain. This is also a condition that is not completely reversible. When the muscles and nerves in your neck and upper back are chronically overloaded, they develop adhesion. Adhesion is scar tissue that builds up and acts like glue – sticking things together and reducing mobility. Restricted mobility actually ads to the issues mentioned above and will cause them to accelerate! The most important thing you can do is fix it before its broken. That means staying on top of your children’s habits right from a young age. You really don’t want them to get to age 20 and already have chronic pain. 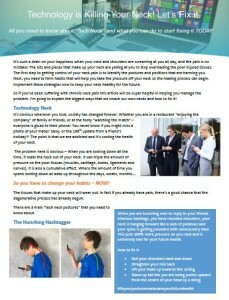 Download my free guide to help you start to overcome your Text-Neck immediately! This guide is full of vital tips and tricks to using your technology safely! If you believe that you or someone close to you is creating long term damage in their neck because of Text-Neck get in contact with our clinic today. We can help and if you are serious about fixing your problem we would love to hear from you.